(1) What's the big deal? What's in it for me? (2) Why organic? Why local? (D) Jobs, Apprenticeships & Business Opps. (A) Why Local & Organic? We all eat. But few of us know what is in our food, what the risks are to ourselves or to society in general. We trust that healthy and ample food will appear, like magic, in the grocery store. We trust the corporations, the "food system", that creates this apparent miracle. And when the experts say it's the best way, most of us believe them (see www.prwatch.org). But there are troubling questions. What are the effects of agri-chemicals  on consumers, farmers, farms, and the environment? Can industrialized, monocultural agriculture provide a secure food supply? What are the root causes of cancer and other disease? How can we best feed a growing population? Who are the vested interests, and who can be believed? Most importantly, what can you do  as a consumer, a worker, an activist, a citizen? Whether you are an eater, a gardener, a job seeker, an activist or a business person, you will find something of interest on this page. From good food boxes, to gardening tips, to food-tasting festivals... from weekend workshops, to university programs... from organic getaways, to world travel... from hands-on volunteer experiences, to life-long careers. You will also find links to related topics such as permaculture, solar and wind power, strawbale construction, and ecovillages. A cornucopia of opportunities, waiting to be discovered, experienced, and tasted! Why buy local? Google search results for "why buy local?" Ground-up batteries on your food?  "Toxic sludge can be relabeled as fertilizer, spread on food we eat. If you think that eating ground-up car batteries and drinking industrial waste is healthful, don't visit these websites. 'Tis good for many businesses to have their toxic waste relabeled as fertilizer. What the heck, the EPA says 'tis OK. These URLs explain part of the reason why. The process began under Ann Gorsuch, nominated to mismanage the EPA by George Bush Sr. (See book Fateful Harvest for details.) Ironically, many autism-spectrum children are being found to have impaired detoxification (often related to gastrointestinal problems), to have high levels of various toxic metals, and to improve subsequent to gut-healing, nutritional support, and removal of toxic metals (by physician-supervised chelation)". www.safefoodandfertilizer.com www.mail-archive.com/ecofem@csf.colorado.edu/msg08519.html . Toxic Sludge Is Good For You (book) www.prwatch.org/books/tsigfy.html  "a cautionary reminder that much of the consumer and political world is created by for-hire mouthpieces in expensive neckties"
What is Biodiversity? Why is it important, what threatens it, and what are ecologists doing to better understand it? seeds from rare and unusual garden plants for the purpose of preserving the varieties. David Suzuki: Organic Farming A Realistic Alternative  "According to a landmark 21-year study recently published in the journal Science, organic farming can produce good yields, save energy, maintain biodiversity and keep soils healthy." Article by Dr. David Suzuki, June 2002 www.davidsuzuki.org/about_us/dr_david_suzuki/article_archives/weekly06070201.asp (if this link changes, go to www.davidsuzuki.org and search for organic farming). For more on the need for organic food and sustainable agriculture (plus analyses and solutions) please see the section on Organizations & Websites, below. The nearest natural food store may be the most obvious, but is far from the only option. Other choices include food box/delivery programs; farmers markets; Community Supported Agriculture; buying direct from the farm gate; food co-ops & buying clubs. 1 Was it grown locally? 2. Is it in season? 4. Was it grown at a small family farm? 6. Were antibiotics or growth hormones used? Was it factory raised or free-range? 7. Was it fairly traded and/or sustainably sourced? 9. How was it processed or preserved? 10. Does it encourage stewardship? Community Supported Agriculture is a way that you can get fresh, local (often organic) food at affordable prices, while also helping to support a local family farm. Farmers markets can include both real, local farmers  as well as vendors who are selling food trucked in from elsewhere. Many mainstream markets have at least a few local, organic farmers. Note that most have very limited hours: many are on Saturday. The earlier you arrive, the better the selection will be. Ask the farmers if the food is locally grown, certified organic (and if not, what is their approach to pesticides). Ask if there are other organic farmers at the market. If you're looking for learning opportunities, inquire about volunteering, work-exchange opportunities, apprenticeships, or paid work. Farmers Markets Ontario www.farmersmarketsontario.com (click on "Market Finder"). Canadian Farmers Markets  we are not aware of any single service listing farmers markets across Canada. To find markets in your area, ask at local community centres, health food stores, etc. Or contact: Ontario, Manitoba, BC: www.cog.ca/chapters/ Maritimes: www.acornorganic.org . Or go to www.google.com and search for "farmers markets" Alberta or "farmers market" Alberta, for example, using the quotes as indicated. Or, try searching for "organic farmers market" Alberta . Substitute the name of your province, city or town. If you know of other organic farmers markets in Canada, please let us know, as well as www.farmersmarketsontario.com. Some of the entries in this section will be of primary interest to gardeners (and those who would like to learn how to garden), while other entries are of greater interest to organic farmers. But there is no clear distinction between the two  don't ignore some sections just because you don't consider yourself a "farmer". For more information and learning opportunities, see also the various sections below: Books & Magazines, Organizations & Websites, Events, Courses, etc. Seeds of Diversity  "open-pollinated", heritage varieties which are not genetically engineered and grow well in organic & low input conditions. Canada's heritage seed-saving network. Their website includes an extensive list of Heritage Seed Companies in Canada, USA, England & France. Don't miss their annual "Seedy Saturday" fairs across Canada each spring, offering seed exchanges, workshops, trade show tables, and more. www.seeds.ca . See also the section on "What is Biodiversity", above, for further explanation of why heritage seeds are crucially important. "Each year, Americans spend as much on lawn maintenance as the government of India collects in federal tax revenue"  Wade Davis, The Globe and Mail, July 6, 2002. 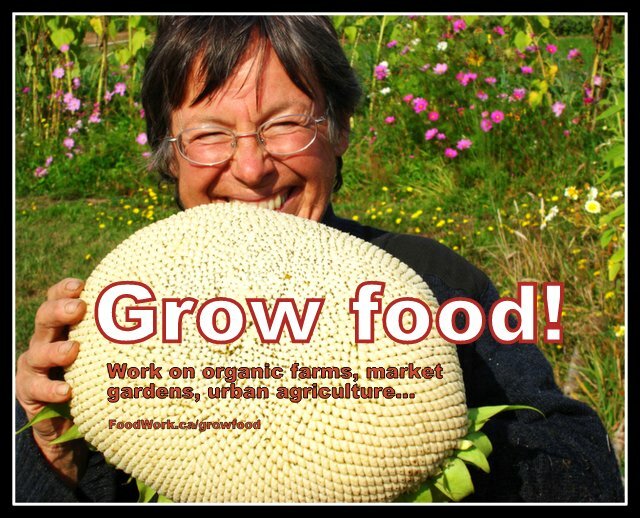 Organic Agriculture, Processing, Marketing, Management (enormous directory of information available on-line) BC Gov't Community InfoBasket (or go to http://infobasket.gov.bc.ca/Infoman/communities/community.asp and click on "Organics". Canadian Organic Growers publish a quarterly magazine, an e-newsletter, and several handbooks on organic growing such as Crop Planning for Organic Vegetable Growers, Organic Livestock Handbook, Organic Field Crop Handbook and several others. Click on "Publications" at www.cog.ca for book and magazine orders. Or click on "COG Library" at www.cog.ca for access to the mailing library of over 1500 books, audiotapes and articles. Visit these websites for news, information, events, resources & opportunities. If you're looking for work or to volunteer, these organizations offer a variety of opportunities in Canada and around the world. If you have an idea about something specific you'd like to do, you could write a grant proposal, and possibly create your own dream job as a "project" of one of these organizations. Canadian Organic Growers  COG is the education and networking organization representing farmers, gardeners and consumers across Canada: www.cog.ca . Subscribe to their quarterly Canadian Organic Grower magazine (included in membership, $20/$30/year). For interesting speakers, networking & discussion, or to inquire about local learning & work opportunities, go to a meeting of the local chapter nearest to you. See also the Directory of Organics in Canada (2). state, or country. Or phrases such as "organic gardening", etc. (quotes included). "Conventional farming produces high yields, but there are also enormous costs  pollution of groundwater, rivers, lakes and coastal areas, and reduced soil productivity through nutrient leaching. The use of pesticides and herbicides also kills beneficial non-target species and poses a health risk to farm workers and potentially to consumers. None of these 'external' costs are factored in to the price of conventionally grown crops."  Dr. David Suzuki (if this link changes, go to www.davidsuzuki.org and search for organic farming). Organic events tend to be as enjoyable as they are interesting. The people are down to earth, and the atmosphere casual. Many are free, or highly affordable. And if you're looking for opportunities, there's nothing like face-to-face interaction. Bring your questions, and don't hesitate to ask them! There's no such thing as a "dumb" question. Below are some organic-related events, mostly in Canada, plus links to other organic calendars across North America. Many more events and workshops happen with less advance notice; to hear about them before they happen, subscribe to our weekly e-mail newsletter (see also: most recent edition; continuously updated on-line version). Please let us know of upcoming events & activities! Events in Canada, USA, plus a few international events. In order by date. Vegetarian Food Fair, Annual (September), Toronto. A fun-filled weekend celebration, free to the public. Sample a diverse cross-section of vegetarian cuisine and learn more about making healthful, ethical and earth-friendly food choices. New vegetarian products; over 80 exhibits; free food samples; hourly cooking demos; dynamic guest speakers; interactive workshops; great vegetarian meals; children's activities. A dynamic roster of presenters will address a range of issues such as prevention & reversal of disease; biotechnology; ethical & cruelty-free investing; and mind/body wellness. Of interest to vegetarians and everyone else. Each year, over 12,000 people from across Canada, the U.S. & beyond make our Food Fair the largest annual vegetarian event of its kind in North America. Free. Seeking volunteers. York Quay Centre at Harbourfront Centre, 235 Queen's Quay W. Info: Kathleen Farley, Food Fair Coordinator foodfair@veg.ca 416-544-8891 www.veg.ca www.veg.ca/foodfair (Toronto Vegetarian Association) [editor's note: while only a few of the exhibitors and events are specifically organic, there should be much of interest and relevance to organic enthusiasts]. For many more events, see: People- & Planet-Friendly's On-line Calendar; links to Other Calendars; the Learning Centres & Places directory; Protect Farmland, Don't Pave It; and the next section. Please let us know of upcoming events & activities! PLEASE LET US KNOW of upcoming organic, ecological & sustainable living events, meetings & activities! We can help spread the word to thousands of interested people. Please use our submission form: www.planetfriendly.net/submit.html  your listing will be posted to the on-line calendar within 24-48 hours, and will also be submitted to our e-mail newsletter. Please tell them you heard about it at Planetfriendly.net! When you phone a host, be clear about any skills, specific goals or interests you may have, and limitations. Make sure you understand the host's expectations: ask ask lots of questions. See also the "tips" section, at the bottom of this document. For other volunteer, work exchange & barter opportunities, go to your farmers market; browse a festival or trade show; see the learning centres listed below; or contact a farm or organization of interest to you. There is a growing number of environmental, ecological, or sustainable living Learning Centres across Ontario and Canada. Also, ecovillages around the world serve as living demonstrations of organic, sustainable living. Participate in a workshop, volunteer, or inquire about apprenticeship & work opportunities. Some of these have very active programs, and a variety of short- or long-term volunteer or barter opportunities. Their offerings vary greatly from one centre to another, and from year to year. Workshop schedules are usually posted on their websites in late winter or early spring. If you ask to be put on their e-mail list you'll get occasional updates. Please note that some of these centres are operated from peoples homes, without corporate or government funding. Please be considerate in your requests. Do not contact farm-based centres later than eight or nine in the evening, unless they specify otherwise. They often have very busy lives and are doing this for little or no money. Try to ask not only what they can offer you, but what you can offer them  if only willing hands and an open mind. Short Courses, Workshops & Workbees in Permaculture, Organic Gardening, Strawbale Construction, etc. (D) Jobs, Apprenticeships, Business Opps. Google search for organic jobs, organic job, "organic jobs" canada, "organic job" canada, "organic employment", etc. Some of the Apprenticeship and Internship sites listed above also list volunteer opportunities. See also Section 11 above, as well as the WWOOF gateway, and the Organic Organizations listed in Section 8, above. Please tell them you found it at Planetfriendly.net! Finding the "right" opportunity is a real skill. First, educate yourself about the alternatives. Ask around, read & surf, try various volunteer opportunities. When considering a paid or volunteer position, it is up to you to communicate clearly with the potential employer, mentor or host. They may live in a very different world than you do: it is a test of your communication skills to bridge that gap. You need to listen carefully, ask appropriate questions and express yourself politely but effectively. The goal is to discover whether the employer's needs and expectations match yours. Ask about the kinds and amount of work; what skills or strength is required; what training or guidance they can offer; pay or other benefits; accommodation, etc. Tell them why you're interested in the position; your skills and experience (if any); your hopes and expectations such as: the kind of work you're most interested in; what you want to learn; and any other goals or expectations you may have. Be as clear as possible about how long you'd like to stay; how committed you feel (or whether you'd prefer to take it a day at a time). Don't forget to mention any particular limitations, physical, dietary or otherwise. Be honest both for your sake, and theirs. If you've never done anything like it before, ask if you could try it out for a short period (a few days or a week), to get a feel it. The better you are able to communicate, the less likely that you will end up wasting your time and the employer's  and the more likely it will be a great experience for both of you. Don't stereotype or be stereotyped. To some people, volunteer always means "inexperienced". To others, farmer means "hard working but not very intelligent". Both of these are very misleading and harmful. Getting beyond the stereotype depends on clear communication  assertively expressing who you are and what you can do. If you have unique skills, interests or motivations, make you express them in a way that is understood. Skills as diverse as sales, marketing, computer skills, cooking, tutoring and handyman skills  can be of great value on a farm or garden. If you have them and are willing to share them, say so. They may or may not be able to make good use of your skills at that time  but if they can, they probably will. Something for every taste. There is a wide variety of opportunities in farming & gardening  part-time or full-time, urban or rural, as an employee or in your own business. If you don't want to be spending time in the garden, there are also opportunities in education, research, writing, sales, marketing, distribution, retail, cooking, landscaping, non-profits, activism  but in any case, it's a good idea to start with a good hands-on gardening/farming experience. I was unable to find a website discussing careers in organic agriculture, so here is a mainstream site: www.cfa-fca.ca/careers/ To learn about organic career paths, you might need to take a more organic approach  ask around, surf, read... try different events, workshops, volunteering, even travel. Be willing to try something new  and to give it your best effort. This is how we grow, expand our horizons, and become better, well-rounded human beings. But don't unnecessarily try to "go it alone"  don't hesitate to ask for help when you need it. Keep looking. Just because one opportunity wasn't right for you  the work was too challenging or not challenging enough; the social or physical situation wasn't to your liking; there was a personality or communication gap between you and your employer  doesn't mean that another opportunity might be everything you could hope for. Reassess your hopes and goals, and keep looking! Don't give up. Full-time farm apprenticeships are hard work. It takes a different kind of energy to stay outside & active for many hours. If you're new to it, give it at least three weeks. Your first two weeks should be by far the most difficult, as you slowly gain stamina. Never quit before the third week! Then you will find that not only does it take a different kind of energy  but it can offer a special kind of joy. Sustainable Living Links  "sustainable living" includes organics, renewable energy, non-toxic home & garden alternatives, alternative construction, etc. listing, please consider making a donation.